Whoever would have thought that inviting the Accidental Locavore to the opening of the new Museum of Feelings was a good idea? I admit that part of my acceptance was because it was soooo unlike something I would sign up for. However, every now and then you have to go for it – step out of your comfort zone and get down with your feelings. It’s in a temporary structure, sponsored by Glade, down by Brookfield Place (you might know it as the World Financial Center). There are five rooms representing different feelings with light, sound and scent. In the first zone, Feel Optimistic, you’re handed a pass card, festive, with silver reflective bits on one side and asked to “hold the reflective surface toward the light to play with beams of bright sparkling optimism.” Since we were just warming up (literally and figuratively) we might have been missing a little of the sparkle. That changed with the second room, Feel Joyful. 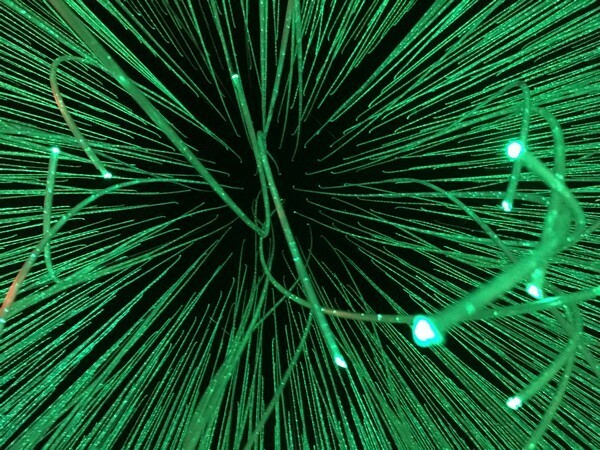 You were given a pair of 3D glasses and entered into a green forest of tiny LED lights hanging from thin, illuminated strings. Mirrored walls gave it a sense of endless depth. It was incredibly beautiful! The glasses might have been a little overkill, as the room was spectacular without them! When you go, make sure to look up at the ceiling and, if you’re braver than we were, try lying down in the room (we were told it was the best view, but didn’t for fear of being tripped over – definitely not joyous). After the green forest (my favorite) there was a plainer zone. Feel Invigorated was a dark cube with animated rings projected on the floor. When you spun around, the rings would change colors, adding and subtracting hues depending on the speed. Probably the most interactive area, you could also commandeer or merge rings with any other people in the room. 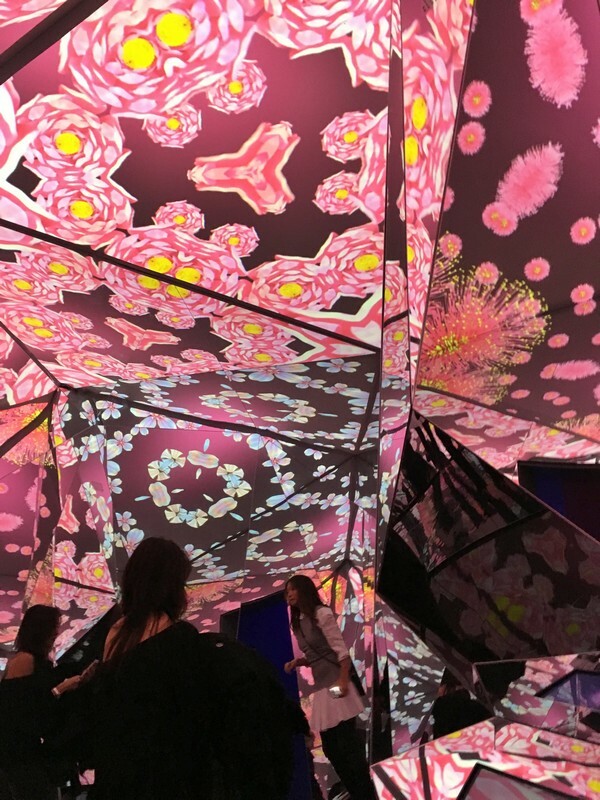 Have you ever been in a virtual kaleidoscope? The Feel Exhilarated zone was exactly that. Multifaceted and mirrored, there were touch screens in the center that allowed you to change the images. 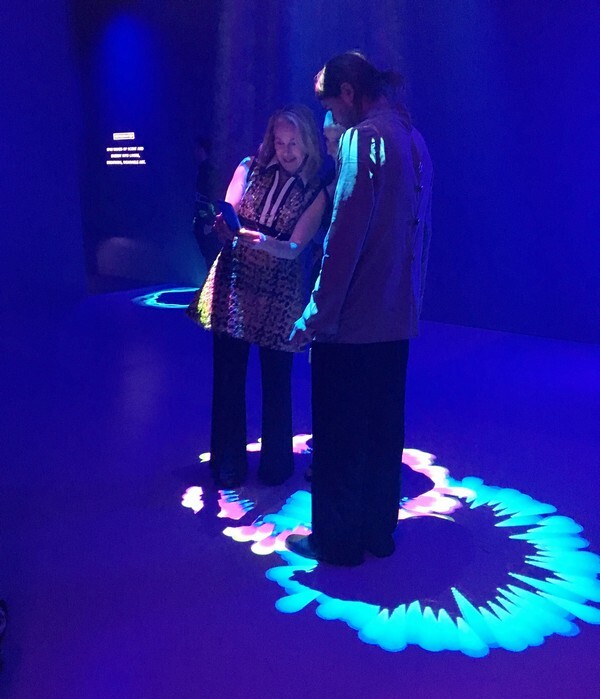 If you started to move your finger around the screen, the projections (designed to accompany the scent Blooming Peony & Cherry) would change, just like you were in a giant kaleidoscope – fun! After all the antics, the last room ended the exhibit perfectly – Feel Calm. 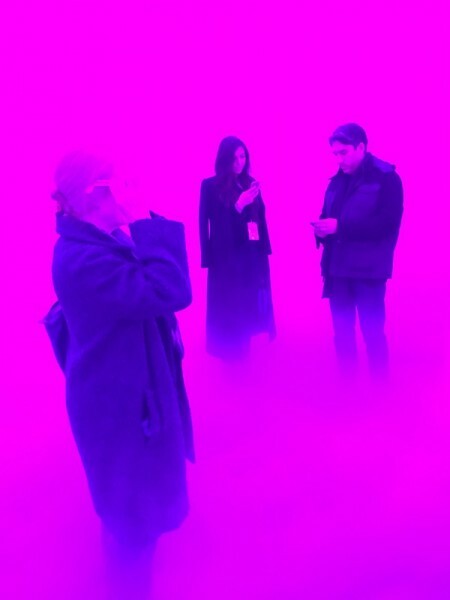 Set up to mimic walking through clouds, it was a lavender environment with seemingly no definition between walls, floors and ceilings. Clouds continually wafted across the floor – a lovely way to finish. Interestingly, my guess would be that the production company hails from LA, as my favorite rooms at the Museum of Feelings reminded me of LACMA. Before you walk in, there’s a Soto piece, Penetrable. 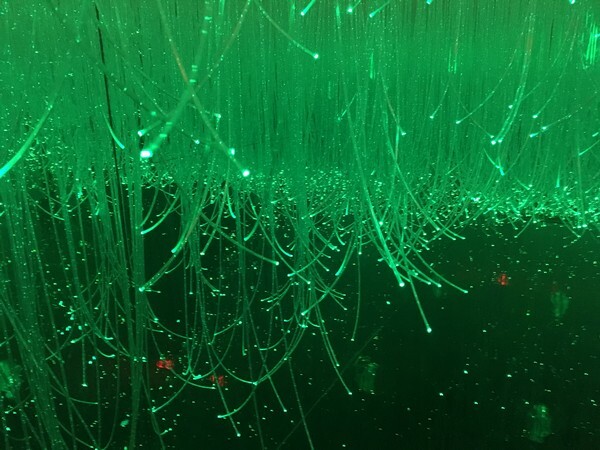 I nicknamed it “spaghetti”, since it was hundreds of strands of pasta-colored plastic hanging from a grid, allowing you to walk through and interact with it just like the joyful area. The calm zone, with its seemingly seamless room created using light effects also reminded me of the incredible James Turrell retrospective. The Museum of Feelings is free and open to the public from Nov. 24 through Dec. 15, Mon. – Sat. (11:00 a.m. – 9:00 p.m.), and Sun. (11:00 a.m. – 7:00 p.m.). It’s located at Brookfield Place, 230 Vesey Street.